"Whatever you conceive you can achieve." With this favorite karma-changing promise, New Agers believe you need only use the "unlimited" power and consciousness of your mind to bring about all your dreams, desires and wishes. Osteen now travels the country, packing out stadiums with his happy-talk. But I'd like to see Osteen pay a visit to China, preach his "your best life now" drivel, and see how Christians there respond. Let Osteen look into the eyes of Pastor Lei who has been repeatedly arrested and beaten for preaching the Word of God in his church - a church not licensed by the Chinese government. How would the American's best life work out for Pastor Lei and his congregation? Perhaps their jail time for the Gospel would give them time to assess Rev. 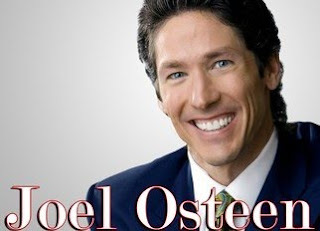 Osteen's claims. Have these and countless other persecuted Christians been beaten, jailed and murdered because they "received what they believed," or did these terrible things happen to them because they did not "develop an image of victory, success, health, abundance, joy, peace, and happiness"? "God sees you as a champion. He believes in you even more than you believe in yourself!" "God has confidence in you." "Believe it or not, that is how God sees you, too. He regards you as a strong, courageous, successful, overcoming person." As long as you are pressing forward, you can hold your head up high, knowing that you are a "work in progress," and God is in the process of changing you. He's looking at your last two good moves. "Be the best you can be, then you can feel good about yourself." But wait. I've saved Joel's most outrageous statement for last (drum roll please). On page 144, Joel elevates us to the heavenlies by pointing out that "You may even need to forgive God." Whoa! And exactly what would we be forgiving God for? As I recall, forgiveness is for sins - or at least mistakes. But which of those has God made? Not a one according to any Bible I've ever read. "Satan's great aim is to deflect us from the center. He will allow us to be devoted to the death to any cause, any enterprise, to anything but the Lord Jesus." Hebrews 13:9 instructs us to not be carried away by all sorts of strange teachings (deflected from the center) but sadly, that is exactly what is happening for many at the hand of Joel Osteen. Instead of pursuing our best life now, we should pursue the things of the Lord so we can have our best life later. I fear that for many who follow Joel's false teaching, this life is the best they will get. The false gospel proclaimed by Joel Osteen and accepted as truth by millions may allow many to achieve what they can conceive of the things in this world, but true to Jesus' promise, they may lose their souls in the pursuit.